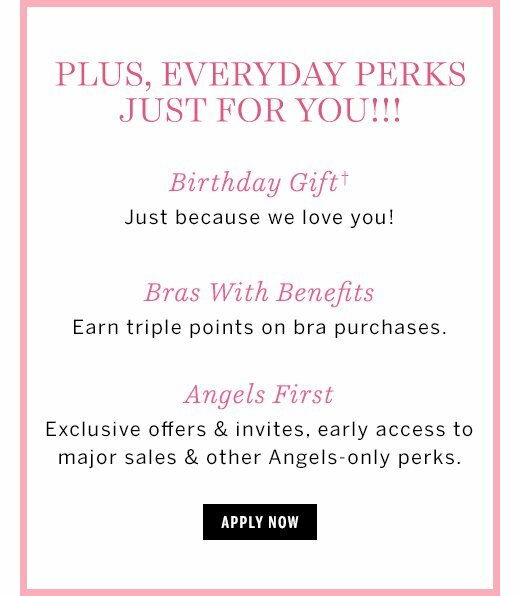 $25 to shop when you become an Angel! *$25 off when you open and use an Angel Credit Card between March 15 – March 31, 2019. Subject to credit approval. Not valid for existing Angel Credit Cardholders. Not valid on previous purchases or as payment on Victoria's Secret Angel Credit Card. The Victoria's Secret Credit Card is issued by Comenity Bank. In-store: Valid on first in-store purchase when opening a Victoria's Secret Angel Credit Card account. Online: Must provide valid email address and US mailing address at time of application. Offer will be received by email. **Subject to credit approval. The rewards program is provided by Victoria's Secret and may be changed. For Victoria's Secret rewards program terms visit www.VictoriasSecret.com/vsangelrewardterms. ***Points calculated based on full price of product(s) before any discounts and is an estimate. Actual rewards points earned will be based on purchase price at time of transaction. †Eligibility is determined two months prior to your birthday month. Accounts opened in your birthday month or in the previous month will receive the first birthday offer the following calendar year if eligible. U.S. residents only. You must use your Angel Card to pay for any remaining balance when redeeming your birthday gift.